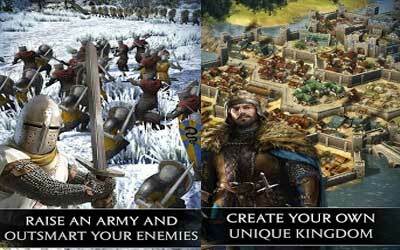 For the game lovers, there is a great game called Total War Battles: KINGDOM APK 1.20. Android users can already download this game for free. Game publisher SEGA re-set up the latest series of the Total War franchise. Total War is a strategy game franchise produced by Creative Assembly. This game is about 15 years old. This is not the successor to Total War: ATTILA, but the continuation of the Total War Battles: Shogun. Total War Battles: Kingdom will set the background history of England in the early 10th century. As you know, at that time the kingdom in Europe was entering the Dark Ages. Players will play as a child of a nobleman who given a territory. Subsequently, he will certainly create forces. Land that has been collected is made to build a large-scale battle. Players will find themselves when managing the needs of their own territory because their army marshals become more impressive. In the end, players will be able to join the war against the rulers of the others in a fight for the throne. Everything is driven by treason, espionage, and cunning deception. Furthermore, what’s interesting about this game is the cross-platform game. Therefore, you might be able to play it with the other gamers on iOS. It is a game of strategy, where players can access the same individual homes via their PCs, Macs, and tablets. When compared to Total War Battles: Shogun, this game surely has a wider game mechanics. The preceding series only invites players to battle with the system in turn. In addition, Total War Battles: KINGDOM for android is compatible with Android 4.2 or more, and your device must have at least 2GB RAM. You also need to be connected to the internet while playing this game.